Ava O’Brien (10) and Joshua O’Toole (9) at the launch of the 2017 All Ireland Credit Union Schools’ Quiz. 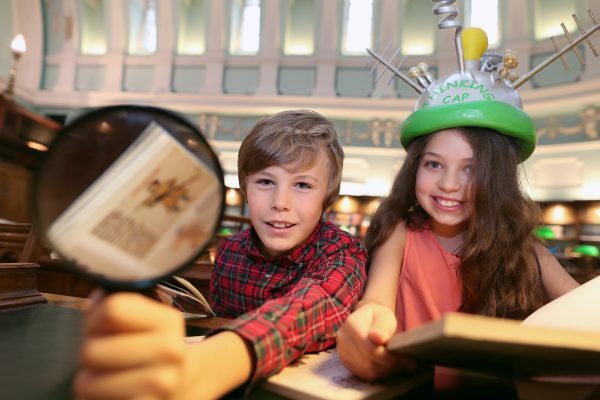 The 26th All Ireland Credit Union Schools’ Quiz will see 25,000 children from primary schools across the country showing off their knowledge. The event will culminate in the national finals at the RDS on Sunday April 2nd. There will be two knock-out stages taking place at a local and regional level, with the first taking place in the final weekend of January and the second in early March. 100 teams will then progress to the grand final. Television and radio personality Aidan Power will fill the role of Quiz Master, with questions covering a wide range of topics including geography, history, music, literature and sport. The primary focus of the quiz is to encourage school children to learn within an environment of teamwork. The quiz is divided into two sections, with Competition A being for children up to the age of 11 and Competition B for children between 11 and 13. The national finals will see the winning teams receiving €1250 per school, with the runner-up teams getting €750 for their schools, adding up to the grand total of €4,000. There will also be prizes given to local and regional winners. Registration for the quiz is now open and registration forms are available in your local credit union. More information can be found at this webpage.